Discovery Cube is hosting their second annual Winter Wonderfest, beginning December 17, 2016 through January 8, 2017, at both their Orange County and Los Angeles locations. This snowstorm of thrills and excitement will offer kids the opportunity to learn the science behind sledding down ice ramps, weather and how snow is formed through hands-on activities. The holiday exhibit will include sliding down a 75-foot long ramp on inner tubes, a snow play area and real snow sledding. Kids will be provided with tools to play with the snow and build snow castles, snowmen, snow angels and all kinds of other frosty creations. Other “snow meets science” learning stations include Animal Adaptations to the Cold, Three States of Water and Cloud in a Bottle. Winter Wonderfest creates an entertaining way to approach education through a day of family bonding during the holiday season. Experience science and physics in action and glide down Discovery Cube’s 75 foot long snow ramp! Fun for all ages, the snow play area is where young and old can build snow castles and snowmen. The thrill and excitement of sledding down a hill is here at Discovery Cube. Real snow, real sleds, real fun! Learn about the science of weather and how snow is formed! GIVEAWAY!! Enter to win (4) tickets for Winter Wonderfest at Discovery Cube. Enter to win by leaving a comment on our Facebook post or below. One random winner will be selected on December 17th, and announced on our Facebook page. Good luck! 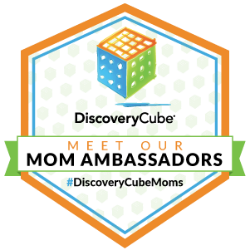 Learn more about Discovery Cube online, Facebook, and Twitter. Gosh, looks so much fun!!! Would love to take kids there!!! Snow play sounds like fun! Such a great idea! Our kiddos would LOVE this! It has been our winter tradition for 2yrs & wish to continue….thanks for the chance! My kids would love to go to this and of course so would I! That looks like so much fun! My family would love this!